January 8, 2016 | ProgressTH 3D Printing is catching on around the world as a localized way to both prototype and manufacture a growing number of functional innovations. Everything from safety razors to fish feeders to lab equipment can now be manufactured on your desktop. But in order to do so, you need input material, usually PLA or ABS plastic (the plastic used to make Legos) in the form of a thin filament which is slowly fed into a heated extruder laying the melted plastic down, layer by layer, until your object is printed. 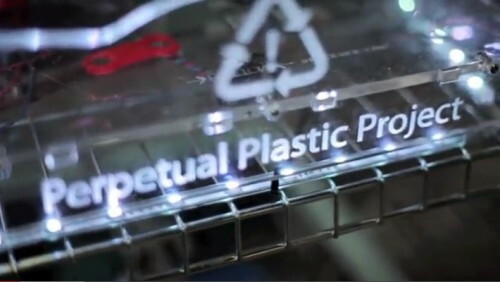 The Perpetual Plastic Project demonstrates how discarded plastic can be recycled locally and used in 3D printing. It means that once plastic enters your community, it can become a perpetual resource either used for manufacturing, or used in its manufactured state. This plastic must be ordered in spools from manufacturers. And manufacturers of 3D printing filament must source PLA or ABS plastic pellets from large chemical plants. The technology to localize plastic production from scratch isn't quite there yet. However, there is another possibility for localizing your 3D printing filament. Plastic recycling. 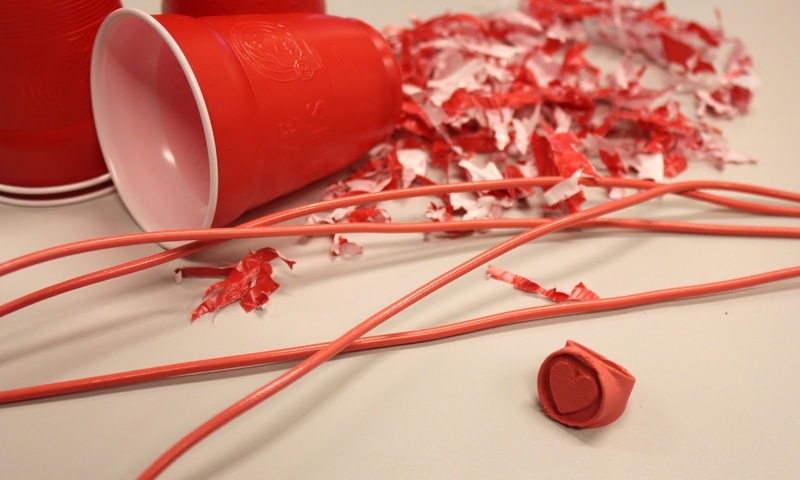 PLA and ABS plastics are also known as thermoplastics, meaning they can be heated up and melted down over and over, which is the secret behind their recyclable nature. 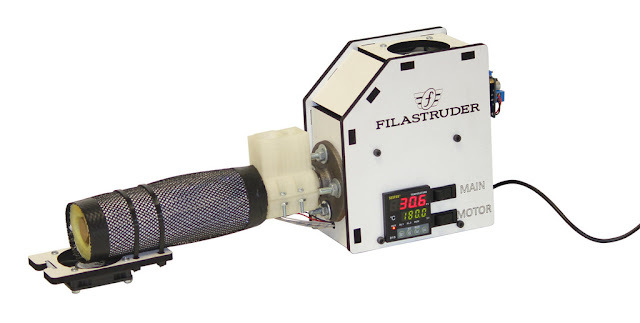 What if you could build a machine that could take shredded PLA, ABS, and other thermoplastics, melt it down, and extrude a thin filament for 3D printing? You can also see opensource write-ups on how to build your own on websites like Instructables. This Filament Factory project on Instructables, for example, at least gives people a starting point in pursuit of building their own systems to suit their own specific needs. Plastic in its various states of being. Cups that we buy from stores in their manufactured state, then shredded into smaller pieces before being sent to an extruder that produces a thin, consistent filament to be used for 3D printing. Finally, a ring, designed and made locally using 3D printing. 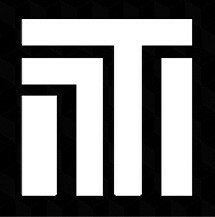 It should be pointed out that some 3D printers can be very temperamental, requiring filament with an extremely precise and precisely consistent diameter in order to avoid jamming and to produce even layers throughout a print meaning home-brewed filament production must make sure it addresses the requirements of the printers it is producing filament for. Still, the prospect of "mining" local sources of discarded or unwanted plastic, and turning it into something new with personal manufacturing, stands to solve so many different problems and empower people on a whole new level, it is worth sorting out the technical difficulties involved. Sourcing and manufacturing from plastic locally shortens many of the immense, global-spanning supply chains modern society currently depends on. By doing so, a tremendous amount of energy is saved, and financial resources are kept local, in communities. It also adds a layer of stability to local economies, with their resource and manufacturing base under their own management, and insulated from sometimes turbulent national and international markets. One of the many kits you can buy to take old plastic and turn it into 3D printing filament. Filament production adds to 3D printing's philosophy of putting the means of production into the hands of ordinary people. It also means that we will start to look at much of what we considered "trash" more as "treasure." This could help keep plastic from ending up buried in land, clogging up our waterways, or otherwise polluting our communities and their surrounding environments. It will also help inform our otherwise very consumerist mentality regarding just where these things we see and take for granted on the shelves of our stores come from, as we seek to do-it-ourselves locally, from start to finish.